A personal bond, hard to break this November. When I met Tom Menino for lunch, Friday last, at the Dry Dock Cafe in the ever transforming Southie Waterfront District I made two strategic decisions. The first, was that I would try the Haddock because my friend Susan told me it's the best in the Hub. She was right. The second was that I was not going to interview Mayor Menino. Instead, I decided to have a conversation with Tom Menino, and from the friendly and straight forward discussion that ensued I discovered a guy who is pretty hard not to like and will be very hard to beat in what will be the mayor's bid for a fifth term as the city's chief executive officer. Tom Menino didn't tell me he's running for reelection and I didn't ask. Tom Menino didn't tell me that he's ready for a political fight, and I'm not so dumb that I needed to ask. He's always ready. But Tom Menino told me in so many words, and through gestures, inflections and other mannerisms that he loves the city so much that not being mayor is simply something Tom Menino's not able to do. And it's not a power trip. It's just a genuine love affair. The type of Frank Sinatra, might have written a song about. It was days after our lunch, on Tuesday, that Menino did make his bid for an unprecedented fifth term official. No surprise there. I think the surprise will be how Menino runs his campaign. In this modern-day pandemic of cyber personality - i.e. twitter, face book, IM's, text messaging, email and all the rest of the no real human contact - Menino, at first glance, is the old fashioned exception to the trends of the day. But it has nothing to do with being out dated. Instead, Menino strikes me as above the gadgetry gimmicks because they're beneath his unbeatable work ethic. As a veteran of city politics, known for rising well before dawn and burning enough midnight oil to dry out OPEC, Menino's a lot smarter than the Twitters. He's more sympathetic than the Face book crowd. He realizes that Joe and Mary Bostonian prefer the personal touch to the You Tube politicking any day of the week. It's even paid off in political dividends. A recent Boston Globe poll shows that more than half of city residents say they've actually met the mayor in person and His Honor's popularity ratings remain high, despite a foundering economy from which Boston has hardly been immune. So on this particular Friday, Menino does what he does best. While chatting with yours truly about everything from the failed lights-out policy at the Zakim Bridge to the recent Easter Weekend traffic debacle at the Mass. Turnpike Authority tolls, he smoothly takes time out here and there, between bites of the clams with bellies and sips of the ice tea with lemon, to warmly greet the regular constituents who come to our lunch table at a steady pace to pay their respects and share a musing or two. He knows each one by name and knows just what to ask. How did that situation work out, how is so and so, did my folks get back to you, etc. Menino may not speak like he's the Socrates of the day, but how he's able to brilliantly remember all these names and all their problems right off the cuff is impressive and would appear to be proof positive that Tom Menino is a smart guy who simply chooses not to use a lot of fifty cent words - and his particularly homespun style, even in the blackberry, techno age - has hardly hurt him since he assumed leadership of the city in the early nineties upon the resignation of then Mayor Raymond Flynn. So what makes this guy tick? I think what we've overlooked - or at least I have on sufficient occasion - is that Tom Menino is a people guy and a people guy can't retire. Before he'd send you an email he'd prefer being at your local bakery at about five in the morning ready to hear what you have to say and then jumping back in his new Hybrid vehicle to call the right department head to fix the problem. I'm' willing to guess that about a thousand pot holes in this city have been promptly fixed simply because a constituent asked the mayor to do it, and then he did. Imagine that. I'm sitting here with a politician who you can actually go up to and then get something done as a result of a quick dialogue. He might even be the last of his breed, and I don't sense any huge movement in the city to send Tom Menino to that place which I sense he may equate to Purgatory - i.e. retirement. Boca Raton might sound inviting to the rest of us, but not this guy. Menino isn't heading for Boca - he's marching forward to a reelection campaign against three contenders who may not even appreciate the juggernaut they're up against. "He has the most tireless work ethic of any official I've ever seen," said City Councilor Rob Consalvo. "He has a laser like focus on the job and what peoples' problems are. He's the ultimate grass roots mayor." But back to the niceties of dining in Southie with the most recognizable politician in New England. Does Tom have any particular gripes on this beautiful Marathon weekend, as we break bread together for the first time in too long a time? Not really. He arrived with Dot Joyce, the best and most reliable press secretary he's ever had, and seems excited about the positive lime light on Boston, hopefully assuaging the tragic story of the past days concerning the Craigs list Killer, a case solved in record time by D.A. Conley and Boston Police. We're even introduced to a visiting foreign dignitary - I think it was the High Lord Mayor of London - whose taking in all things Boston before the start gun fires on Monday. The Mayor is pretty pumped. When he toiled for nine years as the district councilor from Boston's Hyde Park he probably didn't imagine all this - but fate works it's magic, doesn't it? 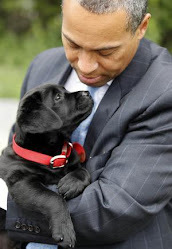 And Menino keeps working his magic - or maybe it's just a Midas touch he was destined to yield in the mayor's office. I ask him about the rather glaring juxtaposition between state and city government, of late. While Governor Deval Patrick has been having a less than marvelous time lately......being governor........Menino's principality has been relatively free from controversy. No state senators being offered silly job deals, no ludicrous trail of emails from staffers, and no hideous traffic jams triggered by any of the mayor's cabinet members. The mayor's not one to criticize the governor (I'm guessing he'll leave that to folks like me) but he makes it pretty clear that on his watch toll booths wouldn't be shut down so that people can admire, for hours, the beautiful pavement at the Mass Pike. The mayor pretty much brings the episode back home, and emphasis that his style of leadership is polar opposite that of some big time bureaucrats. It's anything but hands off. If he sees a problem he gets it fixed, and chances are there are plenty of department heads and their deputies and City Hall Plaza who have their early morning or late night call stories about a call to action from the boss. Sort of like what Hillary said. What will you do if the phone rings at three o'clock in the morning? I suspect the answer from city hall officials would be - do what he tells me to do because he doesn't suffer fools well. But he does suffer atleast one slight with dignity. By the time I finished the perfectly cooked Haddock I asked Menino what he thought about a no lights policy at the Zakim; keeping in mind that I've always considered the spectacular array of blue lighting in the evening to be the one meritorious aspect of a bridge which should never win any architectural hurrahs. Believe it or not, the brain trust at the Turn Pike Authority never consulted with the mayor. "I learned about it by reading the paper," he said. But he wasn't angry nor thin skinned about it. It's as if the mayor has become used to a state government that often forgets the basic rules of protocol, and he's just happy the lights are back on, the way they should be. Should this column leave any of your questions about Tom Menino unanswered, don't fret. Just keep your eyes open long enough and you'll see the Mayor pretty much everywhere in the city greeting pretty much everybody by name. His opponents will have the formidable task of competing with that personal bond. It took decades of hard work to build, and no one's likely to break it without a prolific message and a great deal of luck. Does anybody remember the Prince of Troy of Greek mythology, a rather naive young lad named Paris? Paris decides to steal one undoubtedly beautiful royal named Helen, who awkwardly enough was unblissfully married to the enemy of all the people of Troy, King Menelaus of Sparta. Suddenly, Troy is besieged by Helen’s aggrieved husband, who wasn’t too thrilled to see Paris abscond with his wife. To make a long Greek tragedy short, the entire kingdom of Troy was quite unceremoniously burned to the ground because of one man’s obsession with pleasing a woman nobody had ever heard of. Gov. Deval Patrick apparently rented the DVD Troy and took Orlando Bloom’s character, Paris, way too much to heart. I’ll grant you that state Sen. Marian Walsh - our modern day Helen - may not be a Greek Princess, but exactly why the governor and his staff have spent so many invaluable hours, and nearly all their credibility, doing whatever is required to please Helen - I mean Sen. Walsh - is the vexing question of the day. A veteran lawmaker from Boston, Walsh was an early Patrick political recruit and her reward was to be a posh patronage appointment to one of the more remote agencies on the map of state government, where the senator would have settled down for at least $120,000 annually. The post has been vacant for a dozen years, and it’s been a lightning rod for voter discontent since news of the deal with Walsh was first made public. On March 31 Walsh said she’d remain in the Senate and decline the pomp and circumstance of patronage because the public response to her gubernatorial gift had created a "tsunami." As if that will repair the damage already done to the governor. This childish affair has cost him dearly and voters are telling a local pollster they’re ready to jump ship. After pension scandals, no-show jobs, state senators being indicted, a transportation secretary gone amuck and the revelation of e-mails showing that Patrick aides orchestrated Walsh’s hiring despite their claims to the contrary, I think many of us who supported Patrick have pretty much had our fill. I thought Patrick to be the "different" Beacon Hill leader. But I was wrong, and the growing Tom Foolery of this administration is not only a deal-breaker but a bizarre juxtaposition when you consider that the governor is clearly very caring and highly educated. But his political sensibilities are clearly not well honed. The problem for Patrick is that the average voter has become beleaguered with the governor and his party’s shenanigans at the State House, and few feel obliged to coddle a state government that increasingly resembles the political horror show of Patrick’s hometown, Chicago. As one prominent but disappointed Patrick fundraiser told me this week, "He’s not the guy I supported. If Cahill runs against Patrick, I’m now with Cahill." Who is Cahill? Ironically, he’s the political invention of Patrick’s own chief of staff, Doug Rubin. Tim Cahill is the Democratic state treasurer and recent polling data is basically telling Cahill that if he wants to be governor Patrick is paving the path. Cahill once faced the seemingly impossible task of running statewide against another man with the same last name. It was like figuring out a Rubik’s Cube, but Cahill’s campaign, then managed by Rubin, came out with a hilarious ad featuring Tim Cahill’s young daughter telling voters they could distinguish between this Cahill and that Cahill with the slogan "Tim for treasurer." It was so perfectly cute it worked like a charm, and Cahill’s now sitting pretty on about $3 million in campaign funds and should be encouraged to run by the Channel 7/Suffolk University poll showing the treasurer besting Patrick in a head-to-head race. It’s the first time in years an incumbent governor is facing defeat in his own primary; but not the first time that the catalyst for the incumbent’s downfall was a rather microcosmic issue, all things considered. But just as Gov. Ed King was beaten in his 1982 primary race by Mike Dukakis, largely over endless coverage of King having purchased lobster sandwiches for his state trooper detail (I’m not kidding), Patrick has created sufficient fodder for his opponents just by being the Patrick we didn’t really know. For my money, Cahill jumps in and would be lacking that carpe diem thing if he did otherwise. Shamelessly juvenile e-mails amongst numerous Patrick staffers, reported in the press in recent days, showcase the unprofessional conduct on the part of gubernatorial lieutenants who should be working for the public’s benefit, and not Sen. Walsh’s. As a result, the image of Patrick as the different "Yes we can" leader has been permanently tarnished, if not entirely diminished. By the way, I actually don’t even believe the Suffolk poll showing Cahill beating Patrick by five. Right about now, the spread would be more like ten points. Kevin John Sowrdya is a political columnist who writes for South End News and Bay Windows, as well as other publications. He can be reached at kevinsow@aol.com. First in a new series regarding police culture in the Commonwealth. So where’s the outrage? In a state which prides itself as the "Athens of America," not just for cultural reasons but because we claim to cherish civil liberties, barely an eyelid is raised when the cops toss a prominent talk show host in jail because a computer screen in a police cruiser says the subject didn’t pay a lousy car insurance bill in a southern state from which he moved years ago. How can this lackadaisical attitude toward police excess be so prevalent in the Massachusetts birthed by Sam Adams and governed by a Democratic majority which tells us that the eight years of George Bush and the Patriot Act are dead and buried and constitutional rights are back in fashion? But I guess I missed the fashion show. Police powers in Massachusetts are completely out of control and each of us has our own, particular horror story to tell about an outrageous cop who seems poised to go postal or whose grasp of the truth is lose at best. And this dilemma is particularly acute given my observation that our elected officials fear the unions representing the constabulary forces more than they respect the voters. Thus, even if conservative gabber Michael Graham is not your cup of tea, you should not find it appetizing that a police officer can throw him or you in jail because the Intel Chips running the registry of motor vehicles in another jurisdiction revoke your driver’s license for a reason of minutia. To be blunt, I’m not exactly a Michael Graham fan myself. It’s in this very column that I once took the local talk master to the wood shed for his lame attempt at an interview with Congressman Barney Frank. But that’s not the point. Deciding what kind of a state we want to live in, both as progressives and conservatives, is the issue in need of a healthy and open debate; and Graham, or for that matter any citizen of this Commonwealth, being handcuffed and thrown into jail for a simplistic, bureaucratic issue is a situation worthy of debate and due consideration. Graham was more whimsical than contrite when he recently told his audience that he managed to make his 9:00 a.m. gab shift on WTKK FM only after having suffered undue humiliation in Framingham, where police detained him for what they allege was a minor moving violation. After the perfunctory plate and registration check at the scene, officials told Graham his license had been suspended and that they would have to handcuff and jail him. An ad hominem of hieroglyphics from the Massachusetts Registry of Motor Vehicles, issued to the press in the aftermath of this ludicrous police action, can best be deciphered to mean that the Confederacy rises again. Virginia apparently declares that Graham didn’t pay his car insurance there, and, thanks to interstate cooperation agreements, Massachusetts was all too happy to suspend Mr. Graham’s license here. In any event, Graham has already appeared in court and will seek a jury trial on the charges that he was driving with a suspended license. He says he’ll call the registrar as a witness. I hope he does. The entire affair is almost surreal, and we all know that incidents like these are repeated every day of the week in Massachusetts. I mean, forget Bernie Madoff sipping Chablis in his swank, Manhattan penthouse after bilking enough cash from unsuspecting souls to fill a U-Haul truck. Apparently the real menaces to society are souls like Michael Graham, whose license was suspended because another state is gravely concerned about a pocket full of cash he may owe the auto insurance syndicate. "We see this all the time," said Chris Ott, communications manager for the ACLU [American Civil Liberties Union] of Massachusetts. "We see people getting arrested and hauled off to jail for non-criminal offenses. People are getting arrested all the time for all that drama for something that is legally in the same category as a parking ticket. So yes, if all he [Graham] did was not pay his insurance in Virginia that doesn’t sound like he’s a danger to anyone, and so this does sound unusual." But the roadblocks to change will be hard to navigate. After all, any politician who takes on police powers will not only incur the wrath of the potent and well-funded public safety unions but a fair share of voters as well. Conservatives are pro-police by nature and liberals are increasingly afraid to be labeled as weak on crime, which leads to a blind eye or two being turned in the direction of a few civil liberties being tossed here and maybe a few others being tossed over there. Let’s be blunt; the pervasive attitude in this state is that police officers are free to do basically what they please, and this attitude can be proven by visual observation on any day of the week. But be careful before you whip out your cell phone and videotape what you see going wrong. On Sept. 27, 2008, Mark Hynes of Charlestown was not enjoying his own experience with the Boston Police and was then arrested for videotaping the local cops without their permission. There is apparently a law prohibiting videotaping without the permission of both parties; a law that should be canned so that taxpayers can absolutely videotape police actions, thus insuring proper conduct. I’d even give tax incentives for the action. And though the scales of justice weigh heavily in favor of the blue wall, there’s one member of the state legislature fighting for the change we need. The governor’s deputy press secretary Kimberly Haberlin declined any comment on this subject. But the Chairman of the House Committee on Public Safety, Michael A. Costello (D-Newburyport), has been speaking out and providing a needed leadership role. Costello said arresting citizens for an offense like Graham’s is not jurisprudent and should be corrected in the so-called CORI [Criminal Offender Record Information] reform legislation filed by the governor on January 11. "Unless there’s a suspension for an egregious behavior such as operating under the influence it [driving with a suspended license] should not be an arrestable offense," said Costello, a former assistant district attorney in Essex County and now a practicing defense attorney. "It’s mind-boggling to think that an otherwise law-abiding citizen can be pulled out of their car, be arrested and jailed; to find out it’s a technicality or an out-of-state insurance issue. But that’s what happens. At a minimum we should look at whether or not that should be an arrestable offense." Governor Patrick should jump on board and support Chairman Costello’s efforts to utilize the CORI bill as a vehicle for police reforms which will enhance the rights of citizens and put the brakes on police being able to arrest citizens for offenses which simply do not rise to the level of an incarceration event.